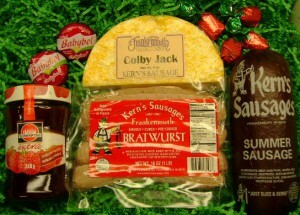 Kern’s food gifts provide a unique opportunity to give a gift that your family, friends or office will enjoy. We offer 9 different selections of gift boxes or can help you custom design one. Our gift boxes are attractively displayed and carefully packed for safety. Personal messages from you can be included on an enclosed card. 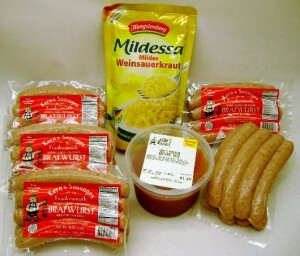 Gift boxes can be ordered for pick-up at our Frankenmuth store location or shipped via UPS anywhere in the U.S.A. You may order in person, by phone, or online. Our other Online Store Packages make great gifts too! 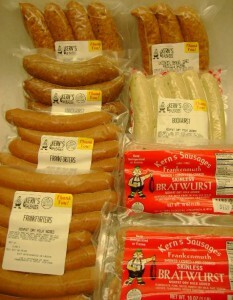 Check out selections such as “Grill-fest” or “Brats with the Works” for a taste of Frankenmuth.